Old Caterhamians were out to prove a point, at their newly refurbished home ground. Old Cats had a youthful side, against an ageing Marlin side, still searching for consistency. Old Cats were quick off the blocks, and seemed quite surprised at the fierce opposition in open play. PJFRFC scrum did well to stand up to a formidable front five, probably the youngest in the league, and half their age. The open play was well contested, thanks to young Sean the new found open-side, another doctor, masquerading as a rugby player, along with tiny Tony and captain Dan Wright. PJFRFC Marlins were strong in the line-out, with Kian MacNulty, the fisher school leaver dominating, and stealing a few balls against the head. The score remained 0-0 with 25 minutes on the clock, with PJFRFC camped in the opposition half, though struggling to convert this to points. 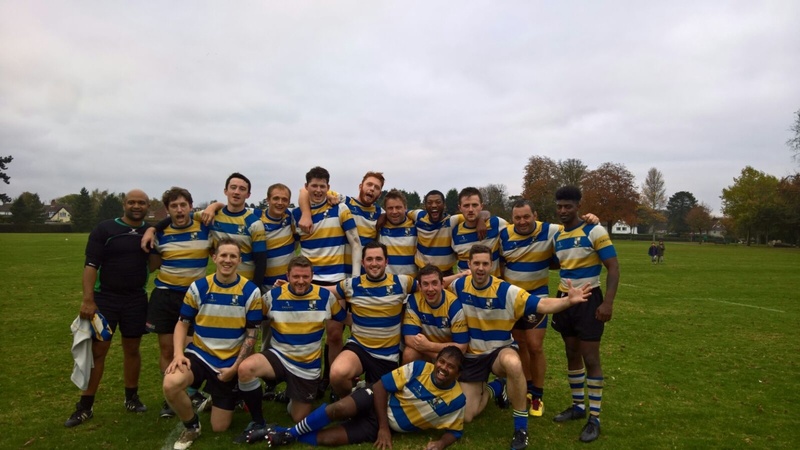 Old Cats had a formidable back row and mid-field, who pounced on spilled ball to attack through their formidable inside centre, who ran through a few tackles to score, and lead 5-0. This was closely followed by another try, again against the flow of play, starting at the back of the scrum, with forwards running channels and the mid-field in close support, with the inside centre scoring to lead 12-0. PJFRFC Marlins, took stock and came back with some fantastic free flowing rugby, Marlins steadied the ship, and working from a stable scrum, with scrum half- Will Walters bossing the forwards around, worked the ball out wide to their reliable out-side centre, Reem who ran an excellent 20 yard sprint to score out wide, 12-5. Old Cats made a few changes, though were made to work for every yard, thanks to some ankle shackling tackles by Jules, Tony, Reem, Trumper and Will. Though Old Cats made good use of their youth and did well to keep the ball alive in contact. PJFRFC Marlins, were unable to keep up the rate of tackles, and thus, Old Cats took advantage of some missed tackles ensuing from a line-out, to power their way through one of their big back row forwards and lead, 19-5 at half time. PJFRFC lost Trumper and Will Walters through injury, though Will only momentarily. Veteran Nick Crumps came on, to add to the wealth of experience, not to mention, out of retirement, inspired by recent Marlin performance. PJFRFC had the wind on their backs, and were facing down hill, and took advantage of this early in the second half. They competed well at break downs, though did make some handling errors, though felt harshly treated, as the opposition seemed to compete from an off-side position. The first score came from a scrum, and ball spun out wide, though good tackling halted progress out wide, Sean was at hand at the breakdown, and picked up loose ball and ran through a few tackles and score his debut try, and narrow the lead 19-10. Marlins did well to keep possession and compete for the ball, in the following passages of play, though struggled to find a rhythm, where Old Cats utilized their opportunities well, and caught PJFRFC off guard, aided by missed offences by referee. This led to two successive tries by Old Cats, leading 33-10. Marlins dug deep, keen to salvage pride and reputation, and again, Sean made an excellent break from within PJFRFC half, and had support from Jules and Tony, though a tackle off the ball on Jules, saw this opportunity missed. Old Cats poor discipline was punished with successive penalties, and Will Walters did well to take a quick tap, and score under the post, Collecting a chip over the full back, 33-15. Old Cats lost a couple of players to injury, and brought on youth, and as Dave Mole remarked, the three front row replacements aggregate age was lower than his youthful number! Old Cats, again, made good use of their youth and fresh legs, along with their big forwards and mid-field to wrap up the game with two further tries in the last few minutes, and finish 43-15. Marlins finish 4th in the merit table, and look likely to face Old Cats again in the play offs. All to play for, over the next couple of weeks.